After watching the new Young Justice animated television show, I was feeling a little Justice League. Unfortunately, all I have are old Justice League International and Justice League America comic books. I decided to stop on a Justice League America comic which included the tag line "Cold War!" 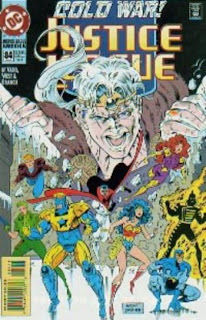 since the first episode of Young Justice involved a bunch of cold-power related villains...none of which were in this lame issue. To begin with I must pay my respects to the first page in comic books these days. The first page gives a nice little recap of where the comic book events left off. People who are just jumping on can understand the gist of what is about to occur and for regular readers the first page acts as a quick reminder of where they left off, story wise. So to the revolutionary first page update...I miss you, and now fully realize your importance. I have no idea why things are happening in Justice League America #84. A quick flip through the book tells me that a guy with a cold powers thinks he can take over the world because he has a staff that turns people and places all snowy-like. Wonder Woman and her team of the B level Justice Leaguers is totally against cold weather, which makes sense in the case of Wonder Woman and her outfit. By the end of the comic of the day nothing is resolved and I dreaded thinking that a Justice League America issue, from the early 90's, would be worth a read. The one part I enjoyed was what seemed to be a quick group of panels which seemed to elude to Darkseid coming to earth. Darkseid is always cool...unless he is on Smallville, of course.